Lighting Global products tested by the Solar Lighting Laboratory of The Energy Resource Institute in New Delhi, India. Lighting Global coordinates a network of sampling agents and laboratories to test off-grid lighting products across the supply chain, from the factory shipping floor to retail shelves. The laboratories listed below are approved to conduct tests for Lighting Global. 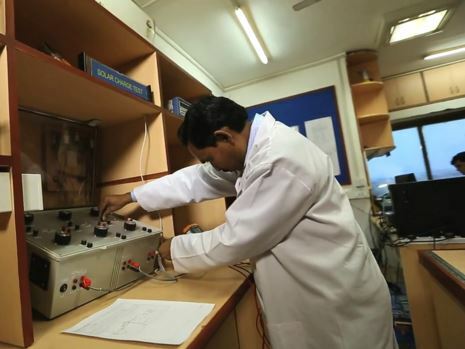 Based on training, capacity, and accreditation status, the laboratories may be approved to conduct one or more types of testing according to test methods in IEC/TS 62257-9-5. Please see the Test Lab Accreditation Requirements document for more details on how to find or become an independent test laboratory capable of providing valid results for Lighting Global according to the IEC/TS 62257-9-5. The primary sampling agent used by Lighting Global is Intertek Hong Kong and their affiliated partners in other regions. NOTE: The Lighting Research Center in Troy, New York, USA and the Fraunhofer Institute for Solar Energy Systems in Freiburg, Germany conducted valid QTM, ISM and MCM testing for Lighting Global between 2009 and 2015.